Let your computer express your personality by changing the desktop background (also called the wallpaper) in Windows Vista. Windows Vista comes preloaded with a number of pictures and patterns that you can use as a desktop background; plus, you can use a picture of your own or one that you’ve downloaded from the Internet. Right-click the desktop and choose Personalize from the shortcut menu. 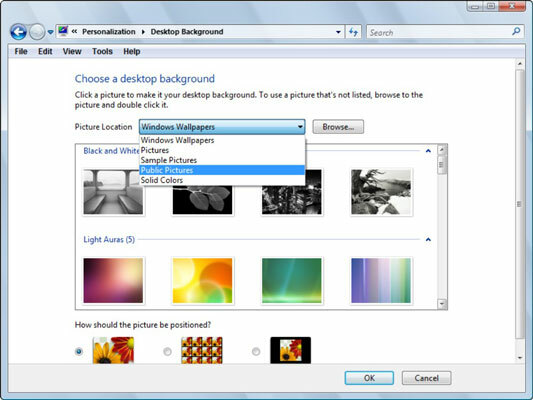 Click the Desktop Background link to display the Desktop Background dialog box. The Desktop Background dialog box. 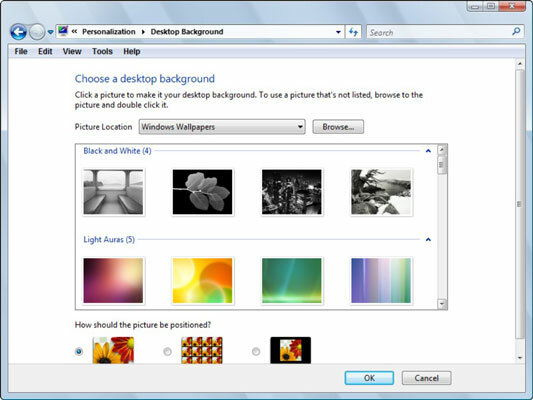 The Desktop Background dialog box opens, displaying a variety of backgrounds that you can choose. Select the location of the background image you want to use. Windows Wallpaper contains the backgrounds that come preloaded with Windows Vista. You can also choose your own Pictures folder, the Public Pictures folder, or Sample Pictures. View the desktop background options in the Background list box and click the image thumbnail you want to use. The background options are sorted by type and size (widescreen). The background is previewed on your desktop. Fit to Screen: This option stretches one copy of the image to fill the screen, covering any background color completely. Tile: This choice fills the desktop with multiple copies of the image. The number of images depends on the size and resolution of the original graphic. Center: Quite logically, this option centers the image on a colored background so that you can see a border of color around its edges. Click OK to apply the settings and close the dialog box. If you have applied a desktop theme before and then go back and change desktop background settings, you will replace the theme’s settings. However, making changes is easy and keeps your desktop interesting, so play around with themes and desktop backgrounds all you like!